In 2013, Bicycle Street Inn & Suites became the ﬁrst new hotel on Mackinac Island in more than a decade. By all measures, the 43 room hotel has been a great success, fueled in part by a strong economy, excellent word of mouth, and a constant upgrading of the property to elevate their guests’ experience. Led by partners Mr. Ira Green and Ms. Melanie Libby, in 2015 they opened their second hotel across the street, the 13 room Waterfront Collection. In 2017, they revealed yet another project — a major renovation of Bicycle Street Inn where they repositioned the ﬁrst ﬂoor retail marketplace into a plush, new lobby and mezzanine level with seven guest rooms . Today, instead of a busy central courtyard, you’ll ﬁnd a private lobby/atrium and two retail establishments: their re-imagined Winchester’s Restaurant with delicious craft food & cocktails, and Sander’s Candy Shop with various sundries including Mackinac’s world famous fudge. For 2017, the hotel also added a ﬁtness room , business workstation , and guest laundry. One might think Mr. Green and Ms. Libby would be content to sit still and reap the rewards of their hard work, but that is not part of their DNA. This dynamic developer duo is at it again with a new hotel project underway at Shepler’s ferry dock near their ﬁrst two hotels. Tentatively named Waterfront Collection South, the 28 room, three story hotel opens in May 2019. 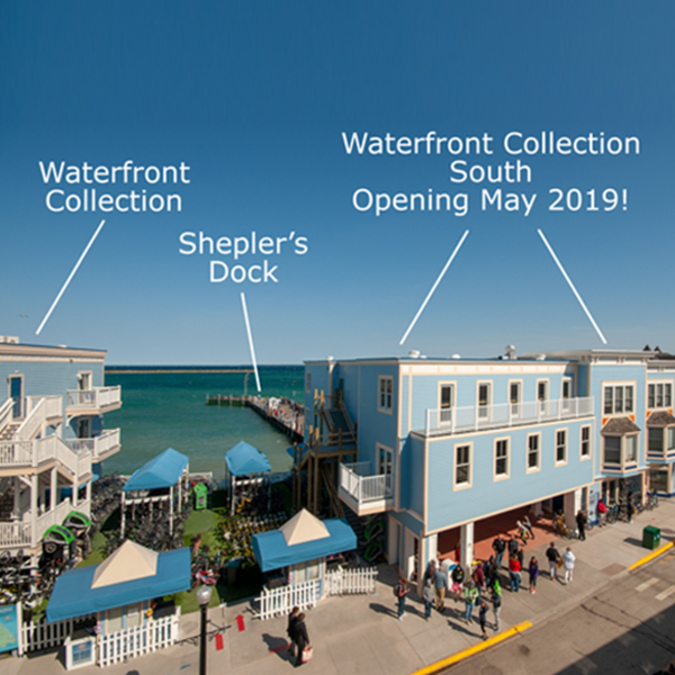 Waterfront Collection South is a unique project that combines the renovation of an existing building with brand new construction built on top of Shepler’s transportation center, next to the popular Mackinac Island Bike Shop and the original Waterfront Collection hotel. Waterfront Collection South will check-in guests at their own lobby, and provide elevator service to beautifully appointed rooms with walk-out balconies offering spectacular Main Street and waterfront views. The three hotels are just a stone’s throw from each other and will provide a total of 84 guest rooms in the heart of downtown Mackinac Island.